As we ended last week with the notion of autumn, we began this week in a comparable manner; two branches of leaves from the same tree – one with green leaves, the other with orange prompted an interesting discussion with the children. We talked about why one might have different coloured leaves and the children came up with lots of different solutions. Some made us giggle; “The birds must have painted them last night” and others really surprised us. “They’re getting ready to fall off the tree”. We’re continually amazed during these discussions how knowledgeable your children are, and even the answers that make us giggle are perfectly plausible. One of the main benefits of a forest school education is that the skills children develop with us will give them the mechanisms to problem solve and the confidence to have a go and come up with a solution, even if they are unsure of the answer. The following day on our way to the forest we found a conker. This became an exciting treasure to find as many of as possible (sadly the squirrels had been hard at work so this proved quite challenging) however yet again it began another discussion about the changing seasons and all that can bring with it. 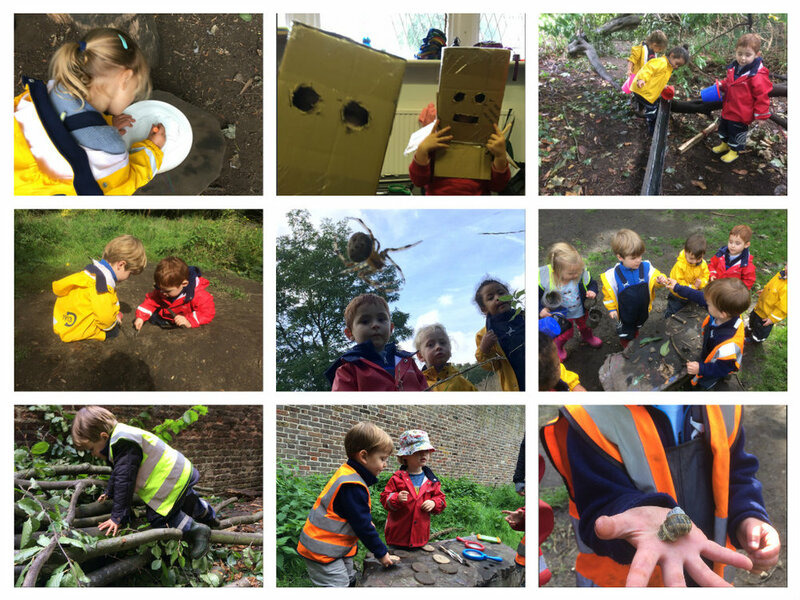 Throughout the week role play was particularly popular and the addition of some biscuit tins to the forest has meant shopkeepers, bakers and even cookie monsters were seen most days. Children would collect sticks, leaves and wooden discs that had been sawn from branches and set them out on a stall in front of them while other children would come to ‘buy’ the goods. This was the case for most children. When the shop keeper was looking the other way, some were very good at pocketing something they liked the look of before running away. As always there are so many opportunities for learning in the forest and this was yet another chance to help encourage empathy, talking about how children would feel if the same happened to them. Kindness to all, caring for one another and empathy are such important parts of our ethos and something we try to reinforce at every opportunity. As well as shop keepers, we had hairdressers. Again the children were developing their communication skills by describing what style they would like, how long or short they wanted it and it’s exciting see how the children’s knowledge and understanding of the world around them, whether that be in nature or the working world, has clearly increased. The children love to make use of the usual activities we provide, with the mud kitchen, story books and ropes all being very popular. However, the return of our slackline was an exciting new addition. This is something that the children who have been with us the longest are accomplished at and something our newest children were intrigued by. Balance and coordination are key on a slackline and with welly boots on this is no mean feat. Despite that, all the children wanted to give it a go and were thoroughly impressive at doing so. Added to this the fact we had bubbles in the forest meant there were activities for everyone. With the bubbles children were curious to know why they floated, what they were made of, what they tasted like (once you catch one in your mouth, you tend not to do it again). It was another lovely week full of giggles and learning. I don’t know about you but I definitely find it easiest to learn when I’m having fun.